Last week my aunts and cousin were chatting on social media about sitting down to a pretty table setting at my Great Grandmother’s table. They reminisced about drinking lemonade from a tulip crystal pitcher and eating vanilla cake with sea foam icing. Of course I had to Google it. And of course, I accepted the challenge. Making weird things is one of my favorite things to do. I also enjoyed making this because I was young when my great grandmother died and I felt a little connected. 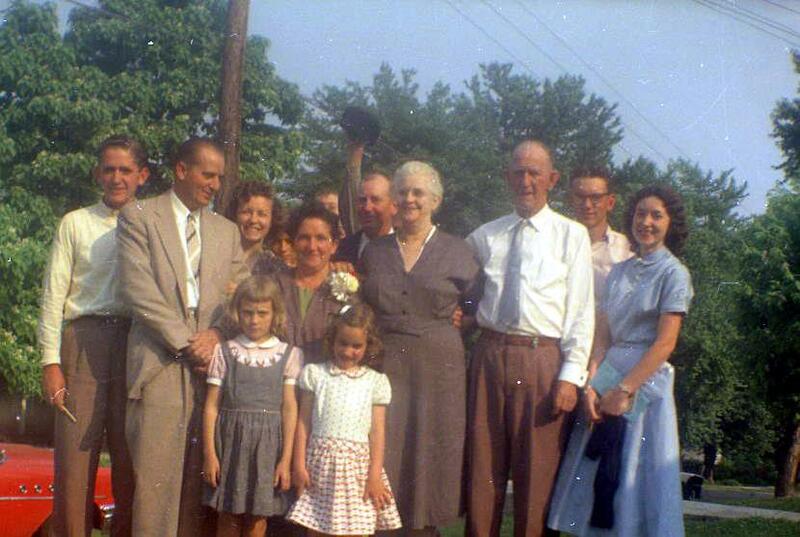 There is my Great Grandmother “Birdie” Denham in the center of the photograph wearing the grey dress. My aunt Eve, who started all this is the beautiful young dark haired woman in the sky blue dress on the far right. 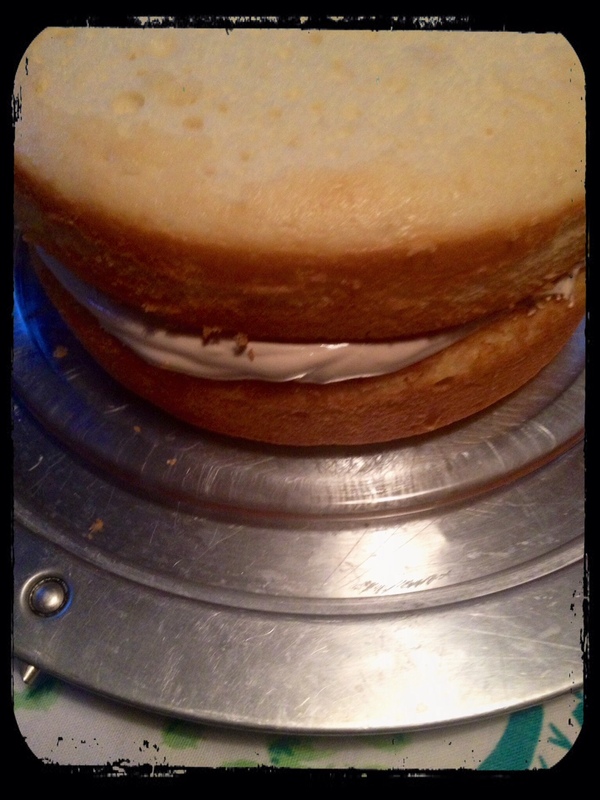 First I improvised a white cake mix. As much as I would like to take the credit… I found the recipe here and added a teaspoon of almond extract instead of the vanilla and 1/8 cup of Mexican sour cream. I can’t just leave things alone. I improvised the improvise. So I made two rounds. And then I started on the icing. Icing is a much better word for this than frosting. This is a science project. What you are doing is science. A cake and a science experiment all in one. A science experiment that can be eaten. First I strongly suggest you go and buy a kitchenaide mixer. Why? because they are fabulous and worth the ridiculous amount of money. My wonderful husband, after a great deal of begging on my part, (he was perplexed that I would want a kitchen appliance for Christmas) put one under the tree for me about two years ago. I have been transformed by this magnificent piece of machinery. I have NO idea how women would have made this without it. You will need a heavy sauce pan, a whisk and a candy thermometer (or really good intuition) and a mixer that can turn wimpy egg whites into prominently peaked fluffy meringue. Put the brown sugar and water into a sauce pan and bring to a bubble. 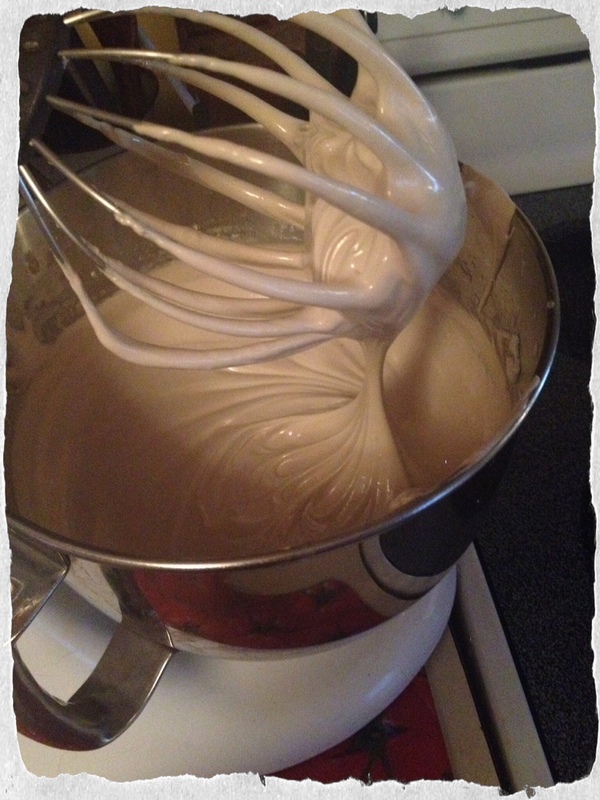 Put the egg whites into the mixer with the whisk attachment and whip at high speed. Meanwhile in the sauce pan, whisk the brown sugar water concoction constantly to avoid scorching. When the thermometer has reached 245, turn off the heat. when it stops bubbling, pour a steady but small stream into the whipping eggs. Clear the kitchen, make all small children and animals leave the immediate area….beacuse you need to BE CAREFUL YOU ARE POURING SCALDING HOT LAVA INTO A BOWL WITH A FLAPPING WHISK…..
Something magical happens… the marrying of the hot sugar syrup and the egg whites is perfect. 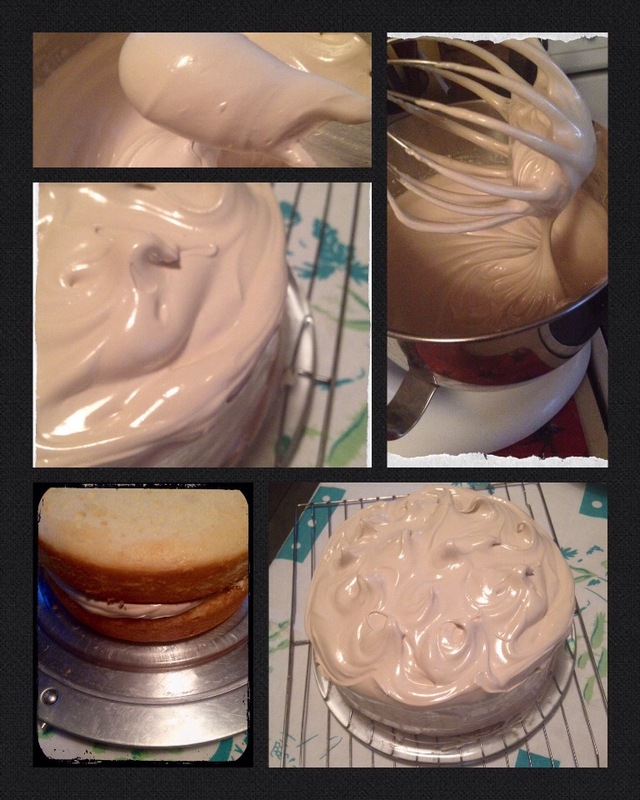 It turns into a glossy marshmallow-whipped cream sort of icing. It is light and airy. It is fat free! It is not a heavy icing. You will not be able to stack decorations or even sprinkles or coconut. Leave it the way it is. It will not hold up. I did put it in between the layers and it just squished down. However, it left behind the sweet caramel flavor of the brown sugar behind. The only downfall of this icing is that being a science experiment, it cannot withstand much. It’s not a travelling cake. The icing will deflate if it gets too warm or too cold. I refrigerated a piece and it seemed okay but I wouldn’t chance it. It’s best at room temperature. This cake don’t keep long either. So there is an excuse to eat an entire cake in 24 hours. Also, if you overcook the sugar, it will become gritty. Seems like a lot of work? Not really. It’s something different and my family enjoyed it… My critique husband said it was missing fresh strawberries…. maybe next time. You will most likely have a TON left over so on a cookie sheet I put down parchment paper and spooned out a few teaspoon blobs, about a inch away from each other. I put them in the oven at 200 degrees for about an hour and then turned off the oven, leaving them overnight. Meringue cookies. They were crispy little clouds of goodness and much better than the food colored ones in the grocery. 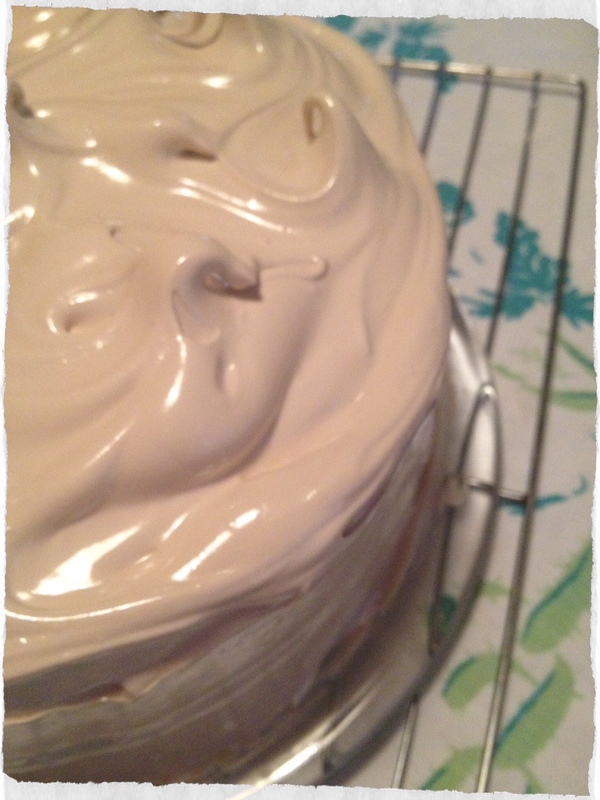 This entry was posted in food and tagged almond cake, cake mix improvement, denham family recipe, icing, improvised white cake, sea foam, vanilla cake, vintage recipe by michelleswaw. Bookmark the permalink.